In Frederick the Wise: Seen and Unseen Lives of Martin Luther’s Protector, author Sam Wellman provides us with the first full-length English biography of elector Frederick III of Saxony. Wellman takes readers on a fascinating biographical journey, revealing why the noteworthy elector risked his realm of Saxony to protect the fiery monk Martin Luther and the developing reforms of the Church. Frederick the Wise is available now on cph.org. Keep reading below for a preview of the book in which Wellman describes Frederick’s first interactions (though indirect) with Martin Luther. In September 1516, Frederick called Spalatin away from Wittenberg to reside at his court. [i] Frederick consulted the quiet scholar in many ways. For one thing, the elector had become interested in the most touted scholar in Europe, the Dutchman Erasmus. Frederick needed Spalatin’s precise Latin to correspond with Erasmus. Spalatin by that time had known for at least two years Frederick’s monkish professor of the Bible at the university in Wittenberg: Martin Luther. In 1515, Johann Lang wrote Mutianus that Spalatin “venerates him [Luther] and consults him like Apollo.”[ii] Spalatin was awed by Luther’s knowledge of the Bible and just about every other religious aspect. Spalatin had surely communicated his enthusiasm to Frederick. The first proof that Frederick himself was more than slightly aware of Luther is in Luther’s December 14, 1516, letter to Spalatin: “You write about the most illustrious prince speaking of me frequently and praising me.”[iii] In a real sense, Spalatin was becoming Frederick’s spiritual mentor and Luther had already become Spalatin’s spiritual mentor. By 1516, Luther was answering Frederick’s questions indirectly through Spalatin about Erasmus, Reuchlin, and the gamut of religious issues. . . . The Scriptures were just as sacred to the Roman Church as they were to Luther. The difference developed because the Roman Church believed their traditions were in complete accord with the Scriptures. Luther began to convince himself otherwise. He was powerfully persuasive too, and rarely hid even the most abrasive sentiment. Frederick found this out firsthand. In 1516, Frederick had it in his power to obtain for Staupitz the bishop’s chair at Chiemsee (between Munich and Salzburg). Staupitz, worn out at fifty-six, was open to this prestige and comfort. Frederick asked Spalatin to persuade Staupitz to accept. Spalatin first checked with Luther. The blunt Luther erupted. A corrupting, administrative office for one as capable as Staupitz? Never! Luther prevailed. Spalatin informed Frederick privately. It seems both Frederick and Spalatin appreciated this blatant honesty in Luther. No doubt Spalatin toned down Luther’s vitriolic message. But how irritated Frederick must have been when he heard Luther’s blatant attacks on the saints and the cult of relics! One example of the former is that Luther had asked Spalatin for St. Jerome’s letters, then delivered a sermon on St. Bartholomew’s Day (August 24, 1516), blasting the legends that had grown up about that very saint. [iv] Bartholomew was, of course, Frederick’s favorite saint. Luther’s blunt character is nowhere revealed more than in his comments to Spalatin that “much pleases your prince . . . which does not please God.” Luther fumed that Frederick may have been a man extraordinarily intelligent in secular matters, but in things concerning God and the welfare of the soul, Frederick was seven-fold blind. Luther blustered that his remark did not have to be kept secret. He was willing to say it to the prince himself. That same year, one day before Frederick’s special All Saints’ Day (November 1), Luther savaged from the pulpit indulgences granted from the veneration of relics! [v] This was his third sermon that year critical of indulgences. He preached that remission of sins from such indulgences was scripturally unsound. Among other faults, it lacked contrition and confession. Further, to think the pope could “deliver souls from purgatory is audacious.” Luther emphasized that the “purchasing of indulgences in any case is highly dangerous and likely to induce complacency.” Afterwards, he was told reliably that Frederick was most unhappy with his sermon. Yet by year’s end, Frederick was praising Luther, certain evidence that Frederick had enormous respect for the expertise of his professor of the Bible. Frederick’s attitude had been typical for him: anger but with restraint, and then reflection that perhaps it was so. [ii]. Preserved Smith, Luther’s Correspondence and Other Contemporary Letters, vol. 1 (Philadelphia: Lutheran Publication Society, 1913), 33. [iii]. Smith 1913, 47. Ludolphy, 389, cites WAB 1 Nr. 30 (14.12.1516). [iv]. Letter to Spalatin in LW 48:17–18. Discussion of Luther’s sermon and subsequent comments about Frederick from Ludolphy, 388–89. [v]. Quotes from Bainton, 1950 (hardcover), 53–54. Also discussed by Lohse 1986, 42–45. From Frederick the Wise: Seen and Unseen Lives of Martin Luther’s Protector, pages 157–59 © 2015 Sam Wellman, published by Concordia Publishing House. All rights reserved. 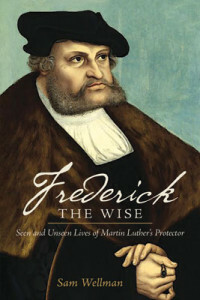 To order Frederick the Wise, please contact CPH at 800-325-3040 or visit cph.org.